Not all bibs are created equally. That's a problem when you've got a particularly messy baby. You know, the kind that smears and drops food everywhere. The kind that dumps their milk out all over. The kind that gets more food in their lap then in their mouth. That describes my kid. 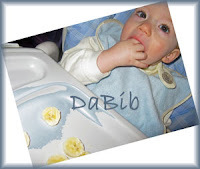 Thank goodness, we had the privilege to try out an especially well designed bib called DaBib. Yes, that is right. It is quite DaBib! What makes DaBib so special? The collar for starters. The collar on DaBib is a specially patented "scrunch, uni-collar." The velcro collar attaches easily to the front of the bib and scrunches up against the neck to prevent leaks around the neck area. My son's shirts always get soiled around the neck area as a result of food getting behind his bibs. DaBib virtually stops the leaks from occurring. Yes, that means less laundry stains for me to fight. Another one of my favorite features is the hide-away food pouch that folds to the front of the bib to catch the food before it ends up on the baby's lap. (As illustrated in the photo to the left.) The bib is a nice size, just right to adequately cover the entire front of my little guy. And, the bib is machine washable and made out of environmentally friendly, non-toxic, and lead-free material. DaBib is offered in two different styles: DaHugs (micro fiber terry front, waterproof backing) and DaGiggles (waterproof, wipe-off striped front, waterproof backing). As soon as we received it we put the solid blue "DaHugs" style to the test. DaBaby versus DaBib. DaBib won. My little guy loves to try and take off his bibs. He had a hard time with this one and the bib stayed on through the entire meal. The bib caught all of the errant food. Because the backing is waterproof, he stayed dry despite the fact that he sprayed the contents of his sippy cup all over his front. Even after chili and spaghetti, the bib came out of the wash looking good as new. DaBib bibs retail for $12.99 each and make excellent baby shower gifts. Watch DaBib in action in the following YouTube DaBib Videos: Vito Gottabone and DaBaby, DaDoll and DaBib. Win a bib! DaBib has kindly offered to give one Brimful Curiosities reader a bib of their choice. To enter, visit DaBib and leave a comment letting me know which style and color you would choose if you won. • Contest ends on Monday, April 6th, 2009 at 11:59 PM CST. Thanks to Family Review Network and DaBib for this review opportunity! I like the Da Giggles in the signature stripe pattern! following on twitter as karenladd and tweeted here! Oh what a neat bib - my biggest issue with my baby's bibs are that her neck still gets drench when she drools or gets food in there when I feed her. I definitely need to check this out as a better option! Visiting for the Ultimate Blog Party - I love your site! I like the yellow DaHugs bib. Thanks for the contest. I would choose the pink print DaHugs. I like DaBurp in solid yellow. I like the Da Hugs solid blue. i like da giggles in stripes! I like the DaHug in yellow. Thanks! I love DaGiggles in signature stripe. Thanks for the chance to win! I like the DaHugs style in Solid Blue. These are very cute and practical. Thanks! I'd choose dagiggles in signature stripe. I really like the DaGiggles in their signature strip.